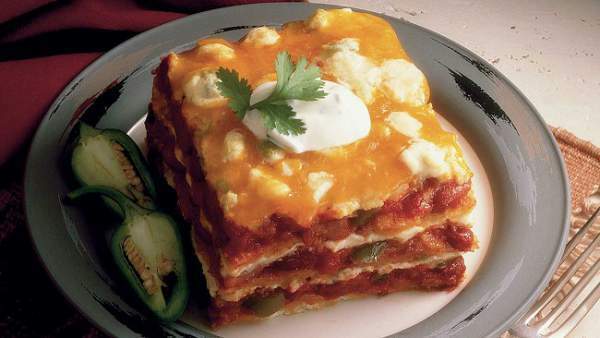 A delicious layered Tex-Mex casserole using three different cheeses. Heat oil in skillet over medium high heat. Sauté green bell pepper and garlic until tender. Add kidney beans. Set aside. In saucepan, combine tomatoes, tomato sauce and chili powder. Bring to a boil, then reduce heat and simmer, uncovered, for 15 minutes. Add to kidney bean mixture. Combine ricotta and Monterey Jack cheeses, chiles, onions and eggs. Spread 1/4 of cheese mixture evenly in greased 13 x 9 x 2-inch glass baking dish. Arrange 1/4 of chips over cheese. Spread 1/4 of tomato mixture over chips. Repeat layer 3 more times. Cover with aluminum foil and bake at 325 degrees F (160 degrees C) for 30 to 40 minutes. Remove foil and top with cheddar cheese and bake 10 to 15 minutes more.